There are hit records. And then there are blockbusters. 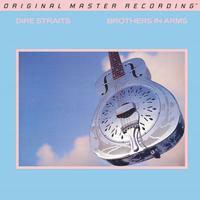 One of the world's best-selling records, a winner of two Grammy Awards, an era-defining reference statement, an MTV favorite, and a set that catapulted an already-acclaimed band to arena status, Dire Straits' Brothers in Arms is the kind of epic spectacular that comes around only once or twice a decade. The sense of realism this edition delivers will leave slack-jawed even the most hard-to-please audiophiles. As the recipient of the Grammy for Best-Engineered Recording, the album has always been a go-to sonic standard, but never has it sounded so reach-out-and-touch-it realistic as it does on this analog pressing. All of the hallmark characteristics - ample spaciousness, ideal balances, widescreen dynamics, immersive depth, lush production - are here in spades. As is music-making of enviable proportions. Reasons for the album's chart-busting success primarily owe to the expertly crafted songs and memorable playing turned in by a group hitting its creative peak. Not to mention the spatial dimensions that cause instruments and vocals to naturally float in a fixed area. Anchored by "Money for Nothing," a caustically themed smash immediately identifiable via Mark Knopfler's resonant finger-picked guitar riff and Sting's "I want my MTV" vocal refrain, Dire Straits' fifth album is stuffed with bluesy signatures, jazz-rock motifs, clever lyrics, and organic accents. Customer Reviews (4.17 Stars) 6 person(s) rated this product. Possibly the best MOFI has ever put out. Must have for any audiophile! This Mo-Fi 45 RPM version of BIA is by far the BEST. Fidelity is mind blowing good. BIA was a well recorded album to start with, but Mo-Fi really kicks it up a notch with this version. The SACD is also superb. Highly recommend this version while supplies last. I've compared this MoFi version with an original 1985 standard CD Made in W. Germany by Polygram matrix 824 499-2 02 * (John Dent version), original 1985 standard LP, 20th Anniversary SACD, barcode 602498714980, and Mobile Fidelity SACD UDSACD2099. This is by far the best version I have every heard and it makes the MoFi SACD sound weak. The bass goes on forever and there is more timbre to be heard in Mark's vocals and in everything else. If you are a fan of this album you must get this. A lot of surface noise. Unusual for a MoFi pressing. I own dozens of them and this is probably the noisiest I can recall. Rather disappointing as the mastering job is first rate. This album is by far one of my favorites on 45rpm speed it is as good as the Doors and Elvis Presley 27 hits this album has a lot of detail on the Highs and Mids Bass is the tightest bass I have ever heard Way to Go!!!!! Please do all of the Beatles this way.